Today’s Apple event was about closure. What started at WWDC in June, teasing for new operating systems, and new devices, and new services, was brought to full fruition over today’s, and last month’s event. Today, Apple released a brand new, 5k display iMac. That’s about 7x the pixels found in an HD TV. 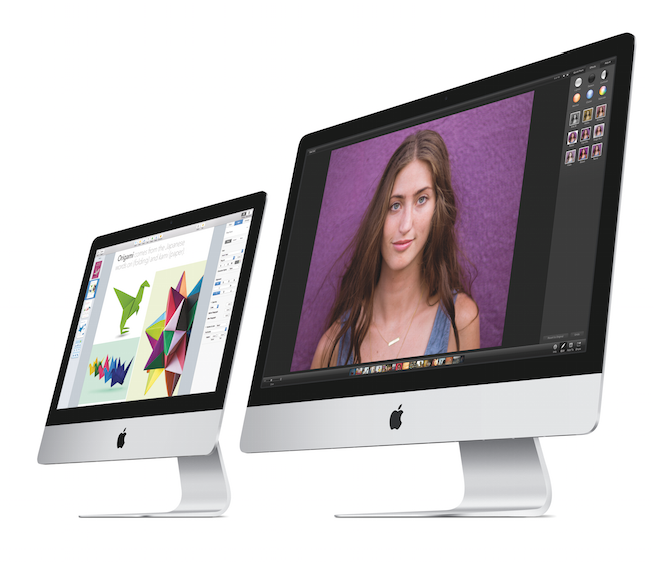 The new iMac also has a faster refresh rate – the rate at which pixels change, and 1 terabyte of storage. If you’d like it, you’re going to have to pay up though. The 27 inch iMac rings in at $2,500! Computers are changing from work devices, to consumption devices. That’s clear. In order to replace TVs though, Apple had to offer a better alternative. Some people predicted an updated Apple TV today (which did not come). Instead, I say that this is Apple’s response to the movement to ditch cable. A more beautiful, high quality display with faster connectivity more storage makes the 27 inch iMac an excellent replacement device for a typical PC, TV combo. One of Apple’s longest-tenured products, the Mac Mini, also saw a modest upgrade of its internals, and a price drop, to under $500, making the barrier-to-entry for Macs as low as the barrier-to-entry for iPads. Apple also released OSX Yosemite, Apple’s latest OS, to the public today. Yosemite is at its heart, an attempt to lure more iPhone users into using Macs, and more Mac users into using iPhones. If you have an iPhone, you can now text, and call straight from your computer. Whenever you open a web page, or document on either device (or an iPad), you can easily switch to another Apple device, and resume what you’re doing. Files will open, with changes from one device syncing to another, as will web pages, and photos. It’s no longer an iPhone, iPad, or Mac experience. It’s about the collective experience – the Apple experience. I’ve been testing these new features for several months, and I can verify that they’re incredibly useful. Other enhancements include improved battery life – a concern for power laptop users such as myself – and a bevy of app updates. Apple showed off these new unified features known as handoff”Handoff”- as well as a new version of their iWork suite of apps with the help of The Colbert Report’s Stephen Colbert, Apple’s new “Supreme Allied Commander of Secret Stuff”. They even called Mr. Colbert on stage, live, to talk about security. He lamented “The only thing that I see when I look down at my wrist, is my wrist”. In a shocking moment, Apple CEO Tim Cook also announced that Apple Pay, Apple’s new payment service, would be launching next Monday, nearly a month earlier than expected, and with hundreds of new major banks and merchants. Considering the limited number of people that actually own ApplePay devices, adoption will probably be slow at first, but that may be a good thing, because Apple will have time to properly scale the service. I do hope it’s more successful than Google’s failed “Wallet” service. Apple also took the time to release two new iPads – an iPad Air 2, and an iPad Mini 3, while lowering the price of older models such as the iPad Minis 1 and 2, and the first iPad Air. The new iPad is thinner and faster (carrying a special chip known as the Apple A8X), with much-improved cameras, touch-ID sensors, and a new anti-reflective coating. The new iPads will be Apple-Pay enabled, but will only be able to use the service for online shopping, not for in-store shopping (due to a lack of the necessary NFC wireless chip). Some of the new features are enticing, but I’ll be sticking to my three-year-old iPad Mini. Fun fact: the latest iPads are less than 1/2 the thickness of the first iPad. Personally, I think it’s a bad move for them to not include NFC chips in the new iPads. While it may have increased costs by a tiny bit, they would have had a boost in users who could actually use the service to the level of ubiquity, where retailers feel that they must use it. 2014 has been the year of the fix. Apple has been leaning on its strengths, while looking to fill in its weaknesses. We didn’t see much innovation, but we saw a lot of useful, thoughtful products. Handoff, and Yosemite will help sell more Macs, and more iPhones/iPads to people who use one or the other. The iMac will help upsell Mac users, and move some away from cable. New iOS 8 features, Apple Pay, and the newer, bigger iPhones and iPads will hopefully draw more users into Apple’s platform from Android, and keep them there. This year, Tim Cook said “How can we make Apple a better company?”, and he might just have done it. Cheaper iPhone On the Way…or not?